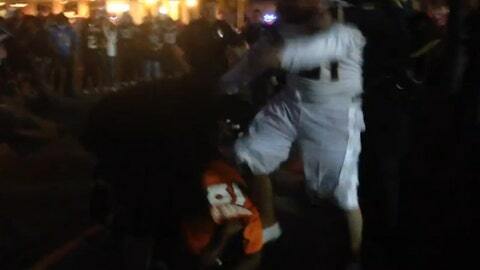 A couple of Chargers fans attack a Broncos fan on the ground in San Diego. Things got out of hand at a gathering of San Diego Chargers fans for Sunday’s divisional round loss to the Denver Broncos. A Broncos fan appears to run right into the personal space (at best, at worst he was starting the fight) of a Chargers fan after Denver’s 24-17 victory on Sunday. First off, that’s just not a bright idea. Especially not in a San Diego suburb, when the game is in Denver. Anyway, he misses his mark and quickly winds up on the ground. And that’s when two Chargers fans launch a brief, but vicious, attack. Luckily, police were on hand to break it up in a hurry. I think we all know what Ron Burgundy would say about this.